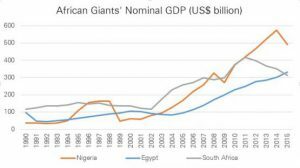 New data from the International Monetary Fund shows that Egypt is now Africa’s second largest economy after Nigeria, pushing South Africa into third place, according to a report from KPMG on Wednesday (May 11). South Africa was already struggling with its demotion from first place after Nigeria rebased its Gross Domestic Product Data in early 2014. Now, it may have to settle for the title of “most advanced economy,” holding on to the infrastructural and regulatory advantages it enjoys. “Psychologically, I do think this is a blow. We’ve always thought of ourselves as the powerhouse of Africa, and then we’re number two and now we’re pushed to number three,” said Lullu Krugel, KPMG’s chief economist. The gap between South Africa and Nigeria now means getting back to first place would be “really tough,” said Krugel, who added that getting back to second place would mean the global economy and domestic policies would have to line up in South Africa’s favor. 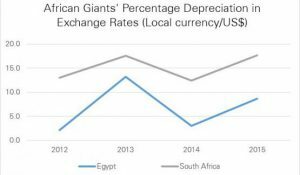 While South Africa’s economy declined from 2012 to 2015, the Central Bank of Egypt tightly managed the country’s currency, according to the KPMG report. The South African currency weakened from an average of 8.20 rand to $1 in 2012, to 12.74 rand to $1 in 2015—a depreciation of more than 50%. The nominal value of South Africa’s GDP has declined by an average of nearly 7% each year in the last four years, due in part to its currency depreciation. Egypt in turn has seen its nominal US dollar gross domestic product expand by an average of 7.5% during the same period, according to the KPMG report. Were it not for the rand’s slump, South Africa would not have surrendered its second place, said KPMG senior economist Christie Viljoen, who authored the report. Last December, the South African rand went into free-fall against the dollar as South Africa shuffled three finance ministers in one week, denting confidence in the country’s hitherto prudent fiscal policies. Depreciation of the Chinese yuan in January saw the rand dip to a record 18 rand to $1, and recover slightly. Political tension between the finance minister and the head of the Reserve Bank further rattled the rand. The country has just barely escaped a downgrade, breathing a collective sigh of relief when Moody’s confirmed South Africa’s BAA2 rating, avoiding junk status. The rating’s agencies reassigned a negative outlook, but South Africans fearing the worst since Moody’s announced the visit, remained grateful. Moody’s said its confirmation showed “that the country is likely approaching a turning point after several years of falling growth.” The ratings agency said it based its decision on a now more reliable electricity system and a more subdued inflation outlook. 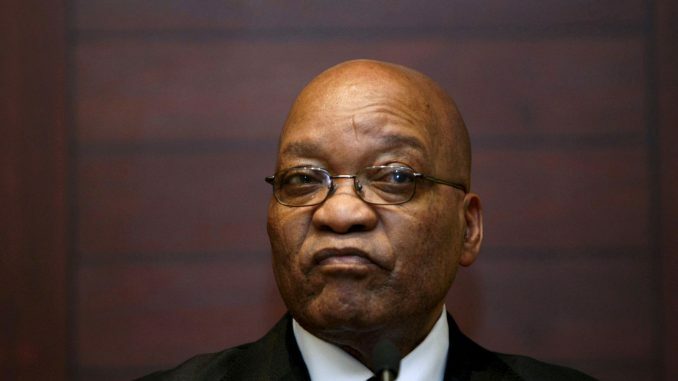 Standard and Poor’s and Fitch have not yet reviewed the South African economy. GDP isn’t everything. Compared to most African economies, South Africa still has a lot going for it, like its solid financial institutions and ease of doing business that would attract investor confidence, said Krugel. But slowing growth in emerging economies and a few own goals in the domestic financial sector mean South Africa must commit to stronger growth, or risk slipping further down the rung.